Armchair Fiction presents extra-large editions of classic science fiction double novels with original illustrations. The first novel is a true classic from the golden age of science fiction, by Nathan Schachner and Arthur Zagat. Time travel is one of the oldest plot devices in the history of science fiction and certainly one of the most beloved. Imagine yourself suddenly hurled through the channels of time and landing in the year 20,000 A. D. Into a world of which we know nothing and one that even those with the most fantastic imaginations could not begin to picture accurately. Provided we don’t destroy ourselves first, it is safe to assume that in 18,000 years the Earth will have changed so enormously, so completely, that it will be virtually unrecognizable—filled with astonishing wonders of science and incalculable social change, not all of which will be necessarily for the best. So here is the remarkable tale of a simple country man who, by the mere act of walking into a grove of trees, found himself thrown thousands of years into the future—a future filled with strange creatures, revolution, and fantastic perils. 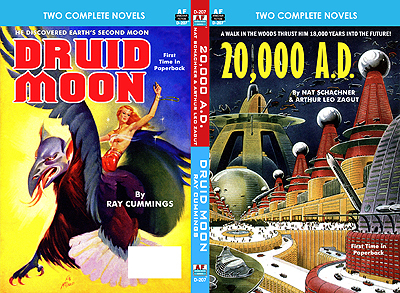 The second novel is “Druid Moon” aka “Onslaught of the Druid Girls” written by the well-known science fiction writer, Ray Cummings. The newspapers were merciless. It had all started because of the strange sense of humor of a conscienceless reporter, and it had soon become the laugh of the whole nation. “Astronomer Moonstruck!” ran the headlines. “Sees Double!” For days the nation laughed at a poor old scientist in Wisconsin. Why? Because this scientist, old Grandfather Blaine, claimed to have discovered a new moon, a second satellite of Earth, out beyond the orbit of Luna, some 440,000 miles away. No other astronomers would support his theory. None had observed it. Not even Grandfather Blaine had seen it. But he was able prove its existence to his own satisfaction. He called this new moon Zonara. And when his grandson, Lee Blaine, reached this mysterious world, he found a tangle of mystery, including a lovely young woman in dire, mysterious danger from an unspeakable danger.